Pohronské Museum has its seat in the former town hall building, which was originally a four-storey Gothic building from mid-14th century rebuilt in the middle of the 18thcentury. The building is a cultural monument. 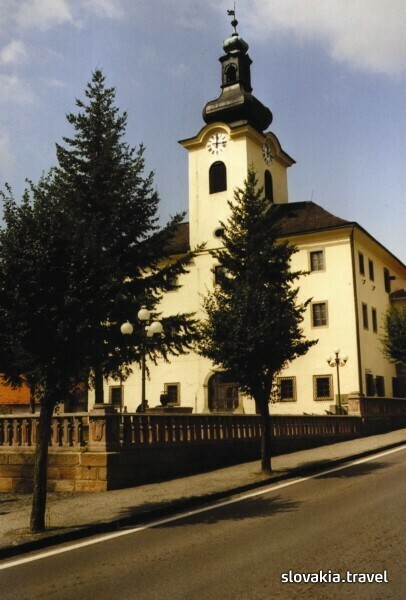 Museum collections comprise archaeological findings, mining artifacts, crafts and folk products (pottery, glass-making products, wood-carvings), weapons, numismatic artifacts and works of art documenting the history of this region, primarily of the town of Nová Baňa. A model of an atmospheric machine for pumping of water from mines that was launched into operation in 1722 is a remarkable and precious exhibit. Moreover, you will find many interesting exhibits in all expositions of the Pohronské Museum – archeological, ethnographic, volcanological expositions, expositions focusing on history, burghers` houses interior, naive art, clocks and watches and an exposition of old photographs with the title "Novobanské reflexie".